Oh, gamers just wanna have fu’un. 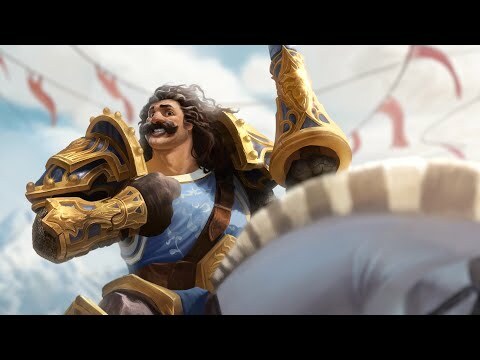 You might as well admit it; you’re not getting enough Warcraft. When it comes to a successful franchise few match the awesome presence of Warcraft. This game has grown from a small RTS to the world’s largest MMORPG. 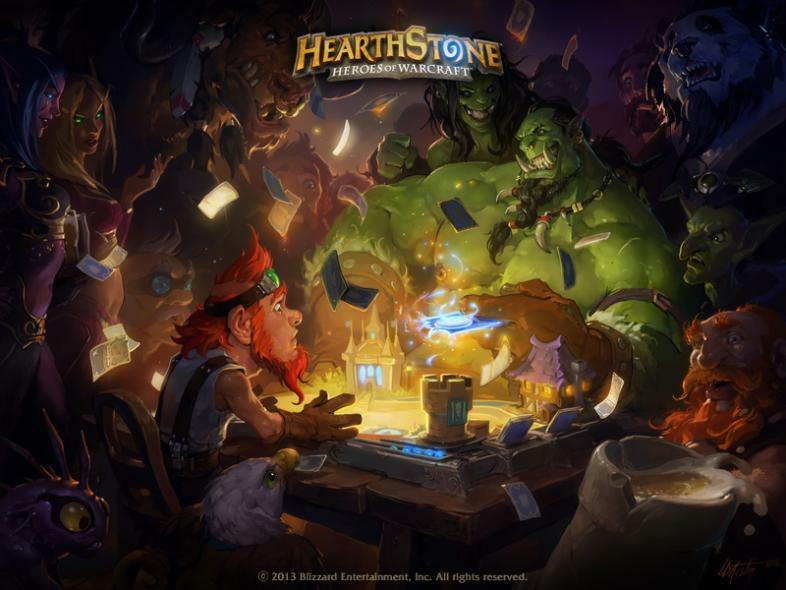 The characters are present in seven video games including the online competitive card game Hearthstone which allows you to choose a hero, build a deck of magic cards and humiliate… I mean battle… players from around the world (or at least those within your region. So, step into the inn and have some serious fun! 10. The gameplay is simple, but the strategy is deep. 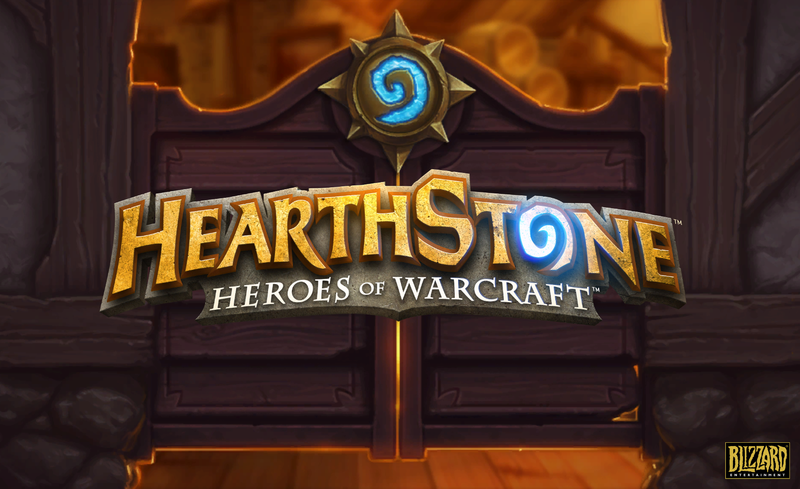 This tournament match will paint a very decisive picture of the Hearthstone flow. 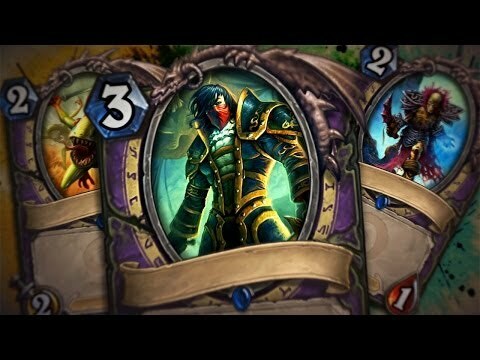 If you have ever played a trading card game you know how complicated they can get, but in Hearthstone the play is simple. Use mana crystals to summon minions and spells in order to be the first to decimate your opponent’s life points. You automatically acquire the mana, so no need to lay lands or beg your opponent for mercy while you wait for mana to build up. 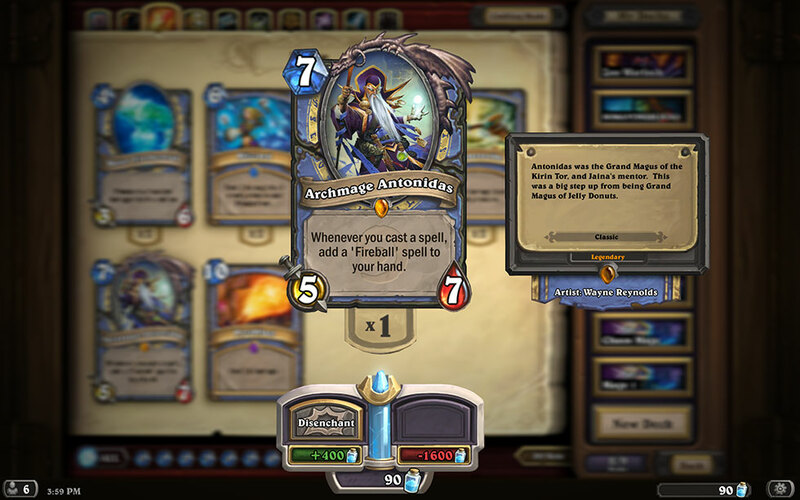 The simplicity of the game play leaves room for players to develop endless strategies using the skills unique to each hero class, and card abilities. Two players with the same hero can have almost completely different decks, and trust me nothing is more frustrating than losing to a guy with the same hero, but a better strategy. It is like losing to your dark reflection. Just think of Dark Link form Ocarina of Time. Get mana, play spell, attack without mercy! 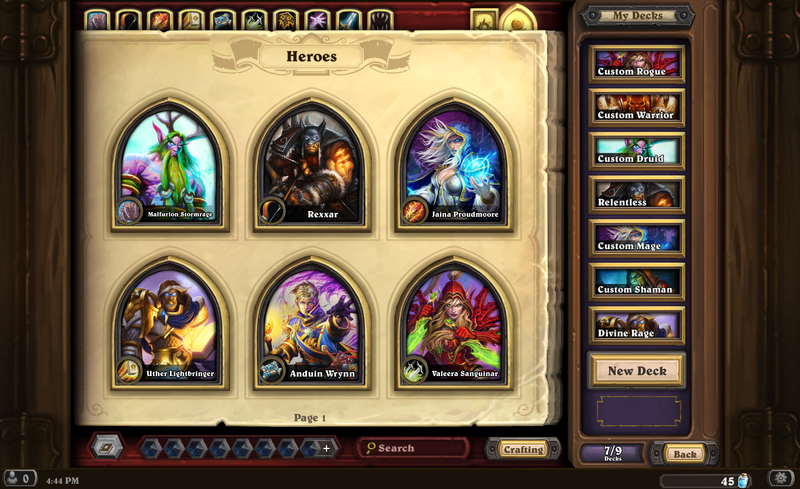 Hearthstone allows you to choose for one of 9 heroes to be your avatar as you dominate the tables at the Inn. Each hero has a unique ability that will alter the tide of the battle, and each class has its own set of unique cards which you can utilize in whatever way suits your fancy. Yeah that’s right you’re fancy. Choose wisely, because your psychologist will use this in your next session. You can’t have a Blizzard game without some kind of leveling up/RPG element. 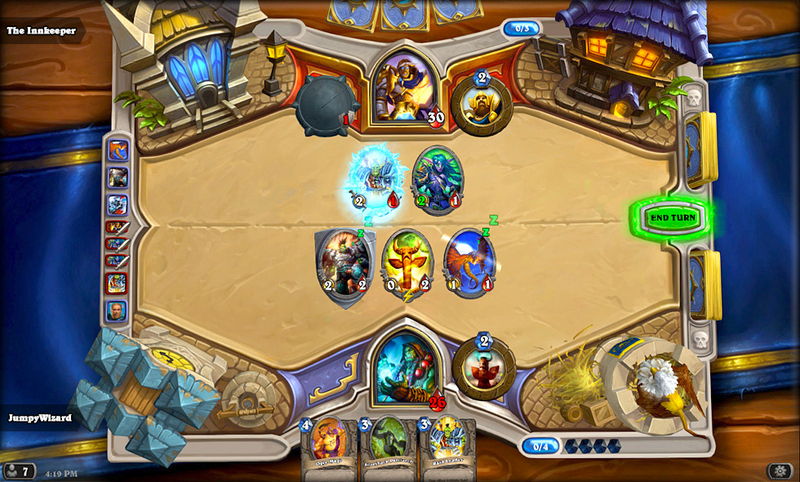 In Hearthstone you level up in two ways. A. You level up your hero class. 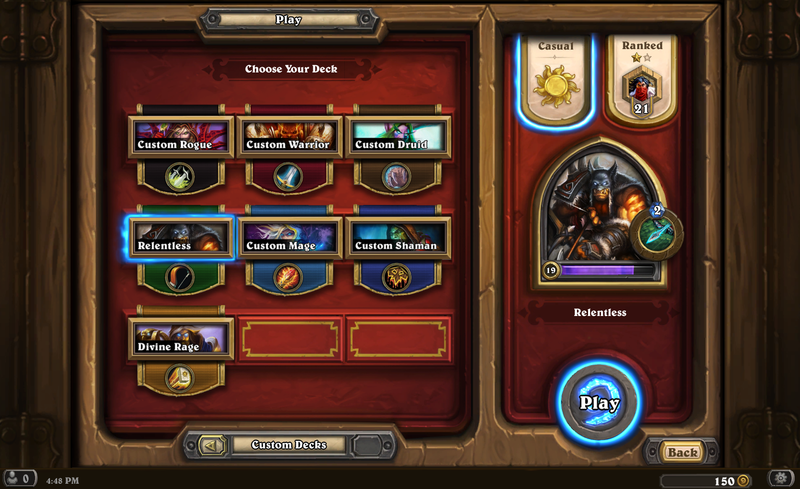 By leveling the hero class you get access to more cards, special “gold” cards, and the “Tavern Brawl” special event play mode. B. By playing ranked matches, and actually winning (no freebies here), you can get special heroes, more gold to buy cards with, and a card back special for the competitive season if you reach a certain level. The level is 20, I wasn’t gonna tell ya, but I decided to be nice. You’re welcome. Don’t judge my low levels; I’m still climbing the ladder. That’s it you wanna fight!? Hone your skills as a champion of the inn through 4 game modes that will tickle you funny bone and tease your competitive fire. The “Solo Adventures” play works well to practice your skills for multiplayer, or a place to hang out if you are antisocial, pitting yourself against the Innkeeper in practice games or in story simulation. 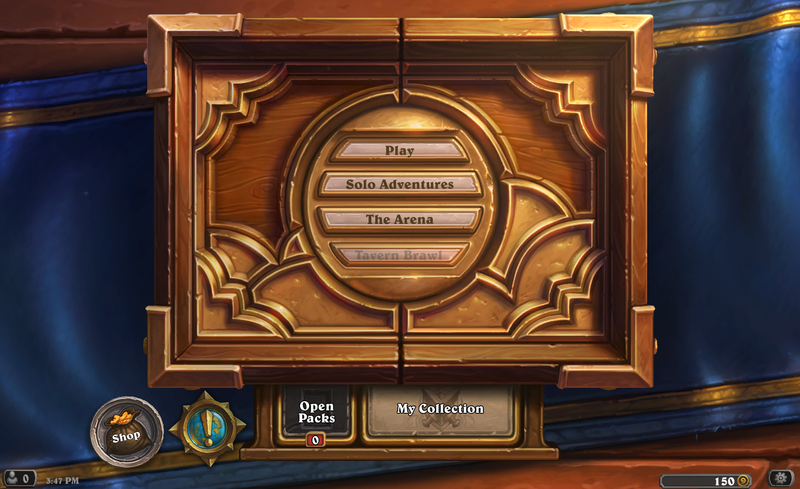 The “Play” and “The Arena” modes pit you against other players where you can earn gold and establish dominance! “Tavern Brawl” unlocks when you reach level 20 with any class, and is a weekly event with special rules applied that will turn the game sideways and test the limits of your strategic ability. Man that sounds kinda epic. Ok go back and reread that description, but with a deep ominous voice. Pretty cool, huh? (Yeah, I know you totally did it). The fourth mode is a little shy... because I haven’t unlocked it yet. 6. Suggestively interpreted emotes to taunt your enemies. 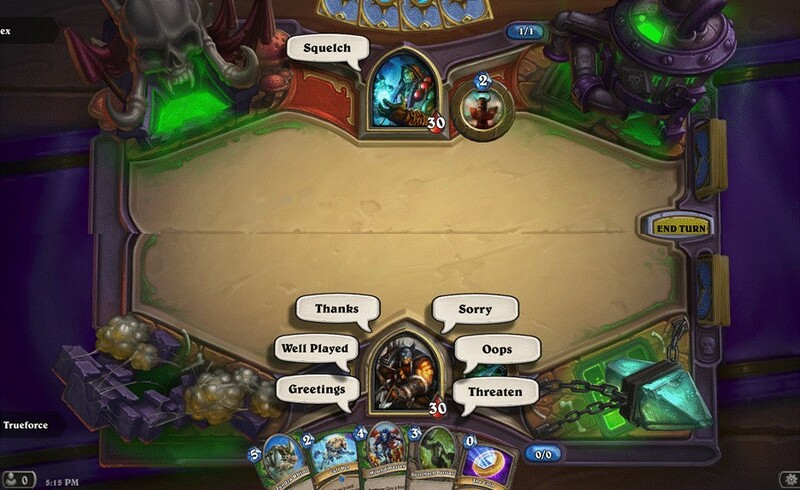 Hearthstone doesn’t have a live chat feature when you are playing in multiplayer, but does have a series of preset emotes that you can use to pester, annoy, or otherwise unnerve your opponent. Depending on how the game is going each simple emote can have drastically different meanings. Don’t like how the guy across the table is taunting you with his “well played” after he takes out your strongest minion? “Squelch” the cocky jerk and shut his emotes down! These may look harmless, but mark my words you’ll be squelching. 5. Craft powerful cards by getting rid of cards you don’t like. 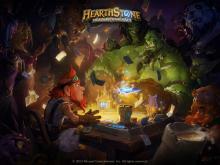 No every card you acquire in the game will be a winner, and you just are tired at looking at the stupid gnomes face. You can trade in non-basic cards for dust, which you can then use to create more powerful cards or build sweet combos for your deck. The cost of cards may seem high, especially since you don’t get much dust when you “disenchant” a card, but by creating these cards you can become a serious contender. I get 400 dust if I destroy this guy, but he costs 1600 to make? These developers must work for the government. Now that you have gotten rid of the ugly gnomes and created a new group of super minions you can build your own customized deck. Choose between class specific cards and general cards to make all challengers bow to your will. 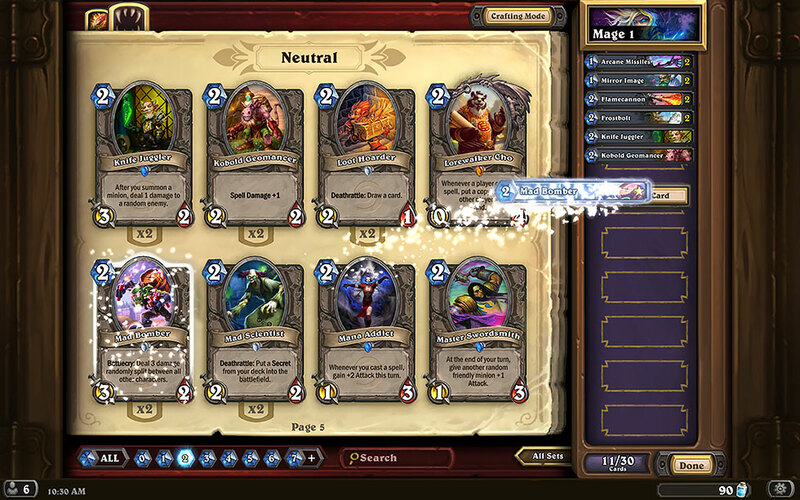 I like to build a deck that lures my prey into a false sense of dominance then destroy them! Muhah hahahahahahahahaha! Don’t steal my strategy, I’m watching you! You only get 30 cards in a deck, no room for fluff here. Great I’m going to have that song stuck in my head all day…stupid Blizzard and their catchiness. 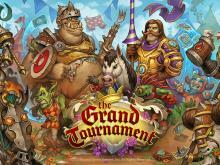 This year blizzard released their second expansion “The Grand Tournament”. Each expansion that is released is included in the game, and gives you the opportunity to acquire cards with new abilities which alter the face of the battlefield. The basic simplicity of the game remains the same, but now you can’t get complacent with your deck because something new is waiting around the corner, and it completely throws you for a loop. That Ogre must have a good dental plan. Have you ever seen an Ogre with such straight teeth? The fastest way to get your gauntlets on new cards is to buy card packs; you buy card packs with gold. The fastest way to get gold is by completing daily quests. 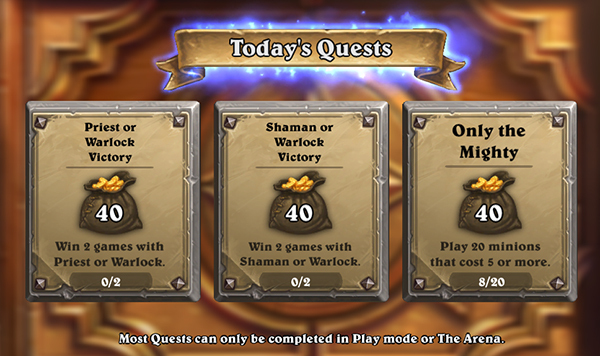 The amount of gold you receive from each quest will vary, but without them you’ll be hard pressed to get new cards. Of course you can always whip out your real wallet and buy card packs too. This is actually the fastest way to get cards, and supports the starving developers. No, I’m not employed by Blizzard, but with plugs like that I should be. Gold is the fuel of the world. How else are you gonna buy drinks at the Inn? They don’t accept IOUs. 1. Competitive Worldwide Tournaments for fame and glory! 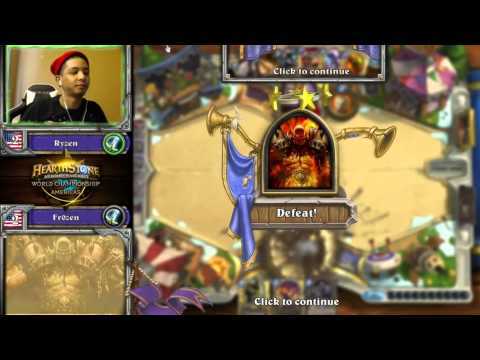 Highlight reel from the 2015 Last Call Tournament, it’s like ESPN for geeks! Another key feature of Blizzard development is the ability to take your time honed skills and use them to win real world prizes. Ha, take that Mom, telling me I’m just wasting my time. 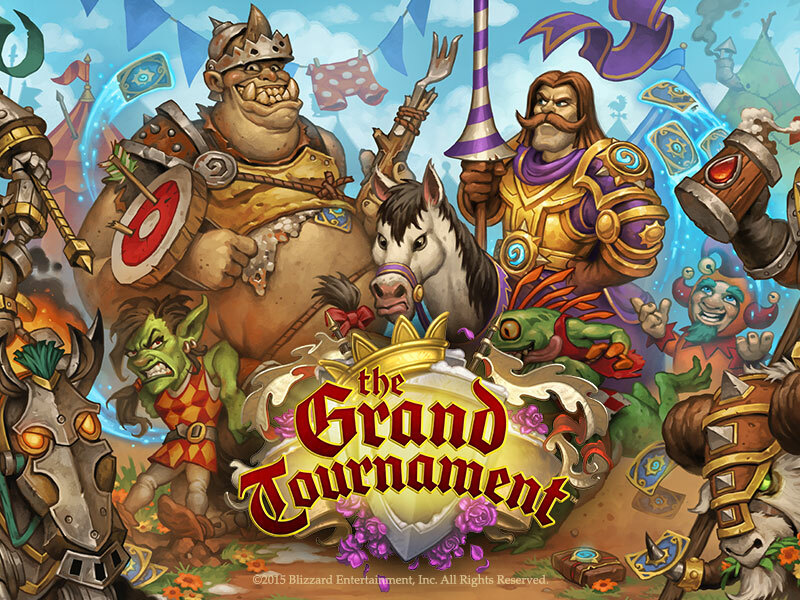 Hearthstone features a series of small regional tournaments that can lead you to compete on a worldwide stage, and take your throne as the King of the Inn. Be careful, though, there is always an assassin waiting to dethrone you. Don’t forget to practice singing, “We are the Champions”. I know you're hooked already, so here is more fuel for your obsession.